As with the Rainbow Cake, this is the third time I’ve made this sponge, and I think I’ve found the perfect icing to go with it: a simple chocolate buttercream. Nothing fancy-pants here. 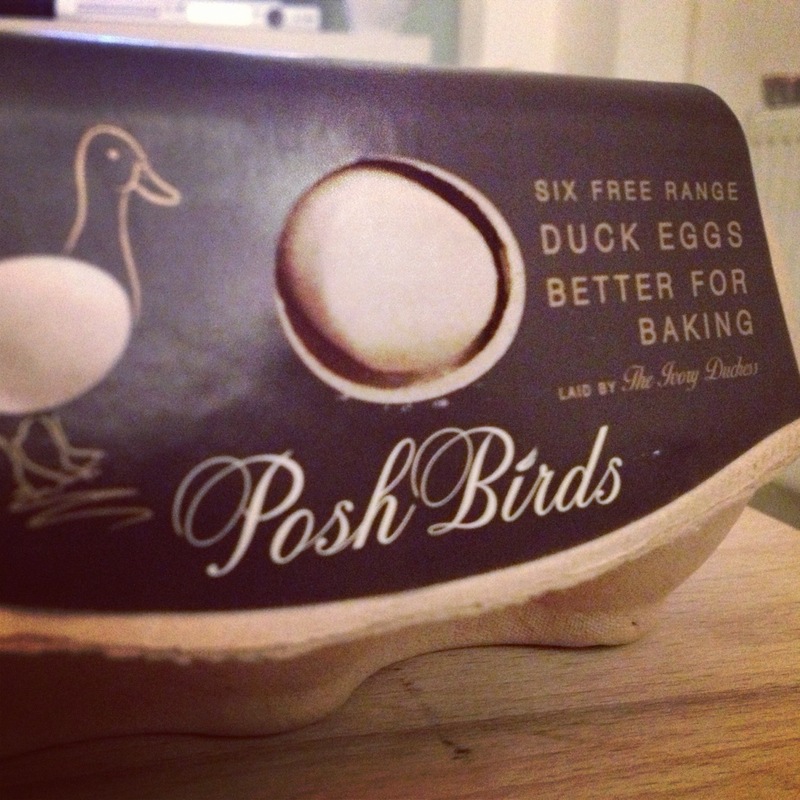 Whilst pootling around Tesco’s with a carefully scrawled list in my little paw, I went to reach for my usual large eggs-from-happy-chickens and my eye was drawn to an egg box proclaiming, “BETTER FOR BAKING” so I thought, “Ooh, well, it’d be wrong not to give them a shot”. The duck eggs were bigger than hen’s eggs, obviously, and I thoroughly enjoyed cooking with them. They were pleasingly fresh and plump, and they made the butter/sugar mix wonderfully creamy when added. The shells are kind of weird and plastic-y. This recipe has always been a lovely one but I believe the duck eggs made it even better, and I shall be doing some research and using them again in the future. I decided to ignore the recipe’s instruction to bake in two tins and divide into four layers, on the grounds that the previous two attempts have domed massively, which is frustrating and wasteful, as it means you have to slice a chunk off. Instead, I baked in three tins for a shorter time, which resulted in beautifully even, moist (I hate that word) sponges. Hurrah. 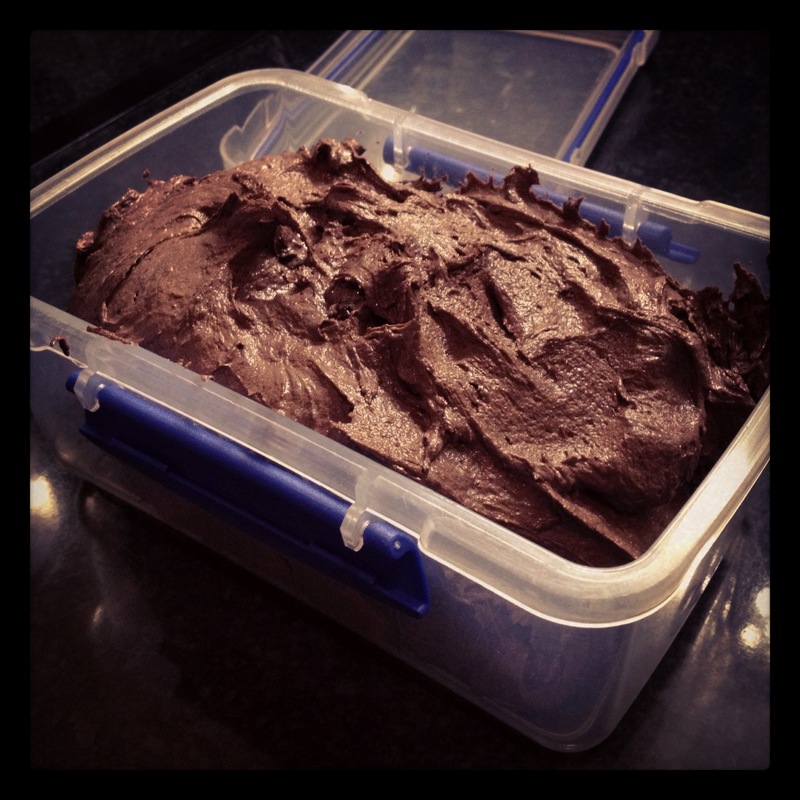 I whizzed up a batch of Hummingbird Bakery chocolate frosting – actually, more accurately, I whizzed up a double batch, because I’m sure that’s what I’ve done before for a three-layer cake. I’ve thought about it extensively and I still don’t know how this happened, but I had almost a litre left when I had iced the cake. Muh? This is SUCH a simple and effective way to decorate a cake and I would whole-heartedly recommend it. The only thing I would advise is that you do it as close to serving time as possible, because the cocoa darkened when the fluid content in the icing got to it. It still looked awesome, but it was just better when it was the powdery finish. 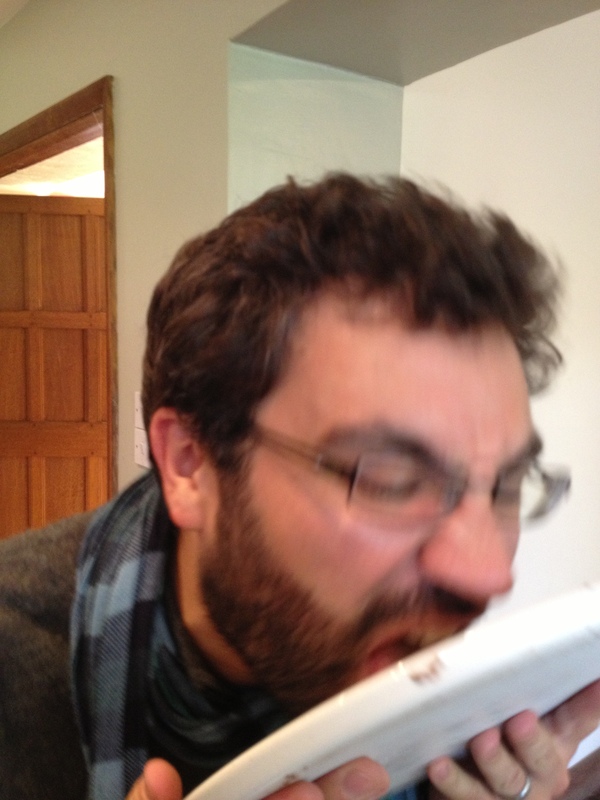 I took the cake on a jolly weekend away with 25 members of Coro (a fabulous chamber choir), with whom I sing in London. They’re a wonderful bunch of singers, and foodies to boot, so I was overjoyed when they demolished the cake and made all the right yummy noises. Even more so when one of them insisted upon licking the plate before the Fairy liquid hit it. 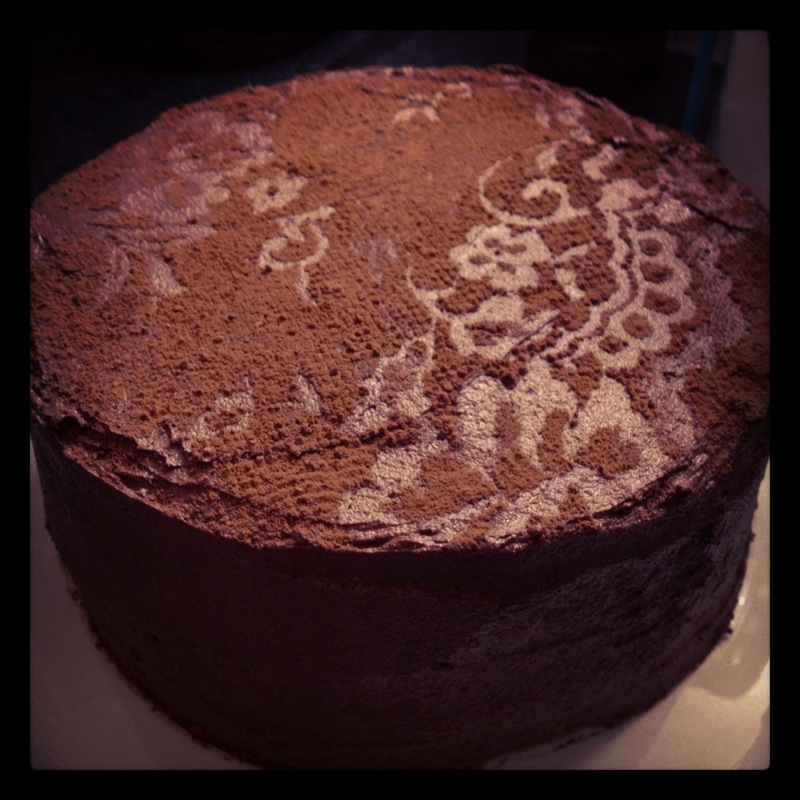 This entry was posted in Cooking & Baking and tagged chocolate cake, Coro London, devil's food cake, duck eggs, lace by wordspicturesandcake. Bookmark the permalink.